June 13, 2005. Over twenty alumni and friends gathered for lunch at the Scottish Rite Cathedral in Indianapolis to visit with Bob Burkardt, Head Athletic Trainer at Wabash from 1975-1984. Bob was in Indianapolis to attend a conference and the opportunity was a golden one. The group told many stories of Wabash athletic victories in an era when Wabash was a powerhouse in several sports. 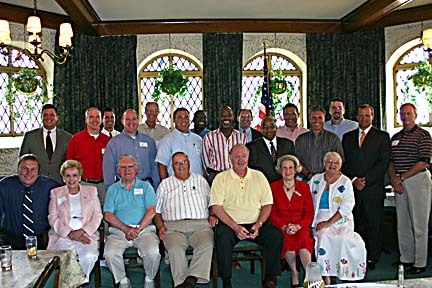 In addition to alumni involved in Wabash's athletic programs, the crowd included long-time friends of Wabash athletics Fran Hollett H'85, Ginny Hays H'37, and Sharon Terry; past Wabash football coach Mark Deal; current Wabash coaches Mac Petty and Rob Johnson; and friend Joe Altott. For other photos, click here.